A biblical vision of the sexual differences that reveals the beauty and mystery of God's purpose for the creation of man and woman. Engaging with Scripture and the fields of philosophy, history, and the sciences, Roberts presents a scholarly discussion of gender theory that goes beyond current controversies---promoting deeper understanding and human flourishing. 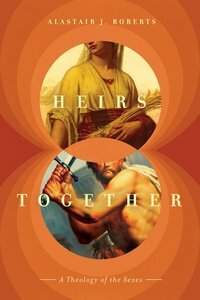 About "Heirs Together: A Theology of the Sexes"
God had a glorious purpose in the creation of man and woman-a beautiful vision for their interdependence to reflect his image. In contemporary society, many have lost this biblical vision of sexual difference, fearing or resisting it instead of celebrating it. This book seeks to place the discussion of sexual difference in the framework of God's design, exploring how gender has been viewed throughout the pages of Scripture, over the course of church history, and across multiple disciplines-revealing the beauty and mystery of sexual difference within God's good world. Alastair J. Roberts (PhD, Durham University) is one of the participants in the Mere Fidelity podcast and a fellow of Scripture and theology with the Greystone Theological Institute. Expected to ship December 2019.